We need your help! Take our Community Input Survey. As a dynamic reflection of the culture in which we live, the specific educational needs of each community must continually change to meet the demands of the present and to support the projections of the future. So too must facilities for education change: rather than being merely a shelter in which the elements of education are delivered and received, they now have become a complete set of community assets, capable of supporting a wide variety of learning experiences and community support services for residents of all ages, abilities, and needs. In June 2010, the OUSD Board of Education unanimously adopted a strategic directions document entitled, "Thriving Students: Unifying Oakland for the Academic and Social Success for our Children." This blueprint calls for the creation of three Regional Zones (west, central and east) to better coordinate, align, and manage resources within the district. The objective of this realignment is to have our schools become Full-Service Community Schools within a Full-Service Community School District where families have access to high-quality academics, health, physical education, nutrition, medical, dental, recreation, housing, employment, and language acquisition services. 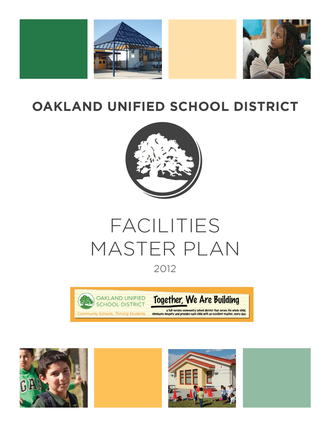 The Facilities Master Plan consists of a set of guiding principles and facility projects that will align OUSD&rsquo;s built environment with its strategic vision. With input from students and families from the Oakland community, elected officials, and OUSD staff, this plan will provide a framework for continual improvement over the next generation of Oakland students and families.